America On Track is about hope, opportunities, and life-transforming programs. Founded in 1995, America On Track (AOT) annually serves over 10,000 unduplicated children and their families in Orange County. AOT allocates 93 cents of every dollar to program services. The majority of recipients are low income and Hispanic, living in densely populated Northern and Central Orange County neighborhoods. 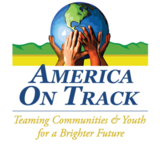 America On Track’s MISSION is to help children and families from all walks of life move toward a brighter future. Our VISION is to create healthier communities by providing evidence-based programs focusing on fitness and nutrition, academic achievement, mentoring, leadership development, and drug use prevention. America On Track’s comprehensive evidence-based programs have generated 20 Local, State and National awards for outstanding service. AOT has substantial experience in delivering quality programs to promote the health and wellness of vulnerable community members. Services are offered in a culturally and linguistically responsive manner, respecting the diversity of the target population. As a result of its experience with these challenging populations, AOT has developed training techniques that focus on the hardest-to-reach people, ultimately sustaining and empowering them in the individual, family and community domains.